Made a mistake on a sudoku puzzle and want to start over? Here is the perfect solution! 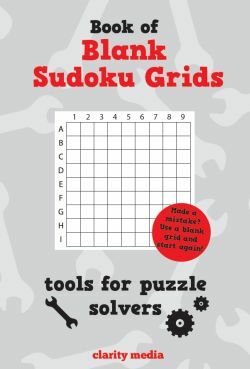 This book contains 100 blank 9x9 sudoku grids, complete with the addition of 1-9 & A-I to help you copy the puzzle over. A great tool to have when completing newspaper sudoku's and a mistake is made. These blank grids allow you to start again and complete the puzzle. All of our puzzle books are printed on very high quality paper, making the puzzle experience all the more enjoyable!